Rendering of people using the space. Image by CC2DCA. 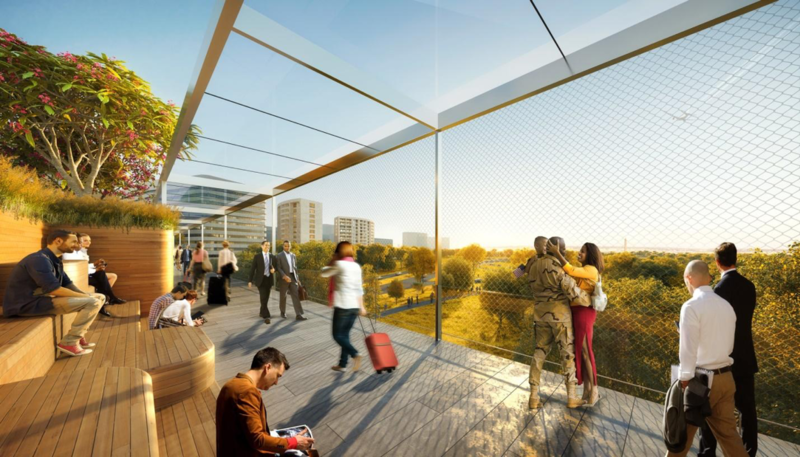 A lofty bridge for people on foot — complete with landscaping, seating areas, and moving walkways — could soon span the gap between a retail-rich segment of Crystal City and Ronald Reagan Washington National Airport. The Crystal City Business Improvement District (BID) has hosted two public meetings regarding their proposal, which includes connections to the Virginia Railway Express (VRE) station, Metro, and the Mount Vernon Trail. The bridge itself will be at least a quarter of a mile long — a five-minute walk — so continuing to take the Metro an extra station will still be quicker for riders looking to simply get to and from the airport. However, those living, staying, and working along Crystal Drive, the main street running through Crystal City, may actually save time by walking to the airport via the new pedestrian bridge instead of taking the Metro. Bird’s-eye view of the bridge over the GW Parkway. Image by CC2DCA. The project website CC2DCA posted presentations of the bridge, but they do not illustrate exactly how it will connect with the airport. 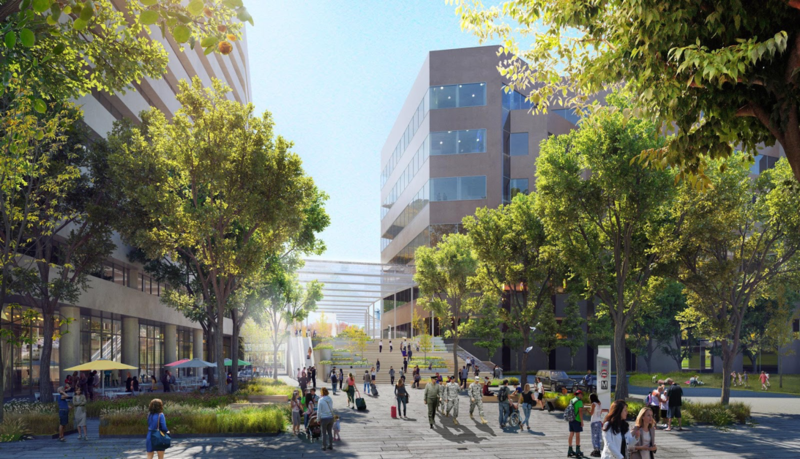 However, according to Angela Fox, President and CEO of the Crystal City BID, it would connect to the northern tip of the existing airport parking garage on the same level as the bridge that connects the garage to the National Airport Metro station and onwards to the airport terminal. Connecting the bridge to the airport garage and existing bridges will make the Metro station only 1,200 feet away from the retail-rich center of Crystal Drive, a closer walk than the existing Crystal City Metro station entrance for many of the residents, workers and hotel guests in the area. According to the same presentation, VRE plans to move its Crystal City station in the near future. This may worry some riders because its current location is quick, simple, and easily accessible for many. However, VRE's Crystal City station improvements are driven by the existing station's platform length, which is too short to service all of the cars of an eight-car train. The Crystal City BID is considering this station relocation and attempting to address it as it plans the bridge. The relocated station would better connect to the center of Crystal Drive, the planned second Crystal City Metro entrance, and a greater number of potential riders. Additionally, the relocation would incorporate an island platform design to accommodate future bi-directional service and even MARC cross-river service, both of which are outlined in VRE's 2040 plan. Will this be the next High Line? 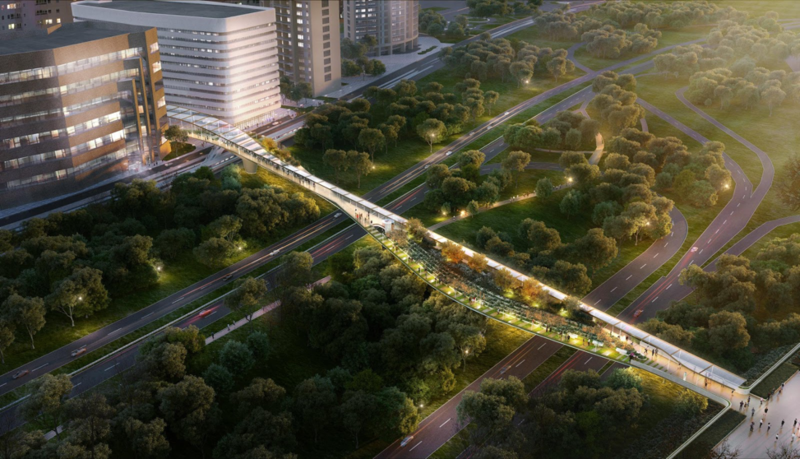 Once Arlington County approves the plan, the BID will spend one to two years planning and then three to six years for design and environmental review, meaning that the completion of the bridge — if approved — is five to ten years away. The BID is striving for a concept like New York City’s High Line, and while some news stories compared the projects, the two locations are very different in nature. The High Line is mostly sandwiched between buildings. As a result, it feels quiet and intimate at many points along its path, creating respite for city dwellers. High Line park in New York, New York. Image by jovare licensed under Creative Commons. This bridge would be taking people from fairly quiet spaces and placing them a few yards above speeding cars zipping along the fast-paced GW Parkway. The project team will need to seriously consider how it treats the acoustics for the people using the bridge. Otherwise, it will simply be another elevated crossing above a busy road, which are rarely pleasant for the people who use them (e.g. the Jackson Street Pedestrian Bridge that hovers over Arlington Boulevard). For example, Chicago’s BP pedestrian bridge was planned with a bulky middle segment that sits above the noisy Columbus Drive, which helps to deflect some of the traffic sound away from people walking on it. The FDR Memorial in DC was planned to be accompanied by several water features for aesthetics, but also to drown out the noise of the various planes flying overhead. How beneficial would this bridge be? There are many potential benefits of the new bridge beyond enabling Crystal City residents and workers to walk to and from the airport. Although one already exists 0.2 miles north of the proposed Crystal City Landing on Crystal Drive, the bridge would add a new connection to the Mount Vernon Trail. This additional connection would enable people walking and biking on the trail to access the airport more easily relative to its existing connection with the airport parking garage. Direct access to the new VRE station from the bridge will also benefit those flying into or out of National who can take the commuter rail down to Quantico and Fredericksburg or go straight to Union Station without having to transfer on the Metro. Lastly, since the bridge will be landscaped and embellished with seating, it will add more high-quality public space to the neighborhood for those wanting to watch the world go by. Crystal City Landing — the entrance to the bridge from Crystal Drive. Image by CC2DCA. For the businesses in Crystal City, this new connection may not generate substantially more revenue from airport users since those going to and from the airport will most likely have luggage with them and may not want to walk across the bridge as a result. With luggage in hand, people are more likely to take public transit or get in a car, as opposed to walking, if they are going to or coming from an airport. If there is no public transit option for airport users, then a pedestrian connection is vital for those without the means to hire a vehicle. My favorite airport experience yet has been flying into and out of Pisa Airport in Italy, due to its proximity to the center of Pisa and the ease of access to the city center. The new Pisa Mover had not yet opened — which connects the airport with the city’s main train station — therefore we decided to walk to our hotel in the city center which was made possible by excellent sidewalks and pedestrian facilities. That being said, had the Pisa Mover already existed, we would have used that instead to get closer to the hotel because of the luggage we were carrying with us. Enabling people in Crystal City to reach the airport by foot certainly is beneficial, but it may not outweigh the cost of building the bridge, given that the Metro already connects the two. A few Crystal City residents are known to go to the airport for lunch, but most likely the bridge — if designed well — will attract tourists because of the project’s novelty. If you live around Crystal City, would you use the bridge to reach the airport instead of taking the Metro for $2.00-$2.25? Do you think visitors with hotel rooms in Crystal City will choose to take the bridge, instead of navigating the Metro or taking a cab? Max Devilliers recently earned his Master of Civic Design in Town and Regional Planning at the University of Liverpool and is currently on the job hunt. He loves anything and everything related to streets, sidewalks, buildings, and transportation and was born in DC but went to grade school in Falls Church. He currently lives in Lincoln Park without a car. If you are at the Van Ness Metrorail station and head inbound on the Red Line, what is the next station you will reach? Feel free to ignore station subtitles.